Recession buzz remained stable from February at a moderate to elevated level. 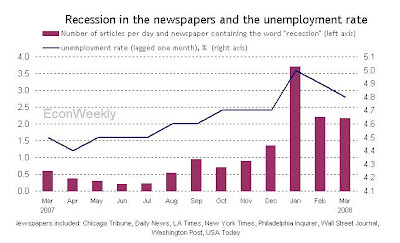 The Washington Post and the New York Times printed an average of 4.8 stories per day containing the word “recession,” 0.2 more than in February. And among the set of eight major US newspapers that I track every month, each one published 2.2 stories per day, about the same as in February (see Chart 1). Note to Chart 1: since the unemployment rate in any given month is released by the BLS at the beginning of the next calendar month, I plot the lagged unemployment rate alongside the current-month R-word count. 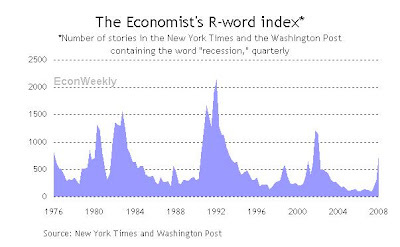 Now that the first quarter is over, I can also report The Economist’s R-word index, which is the number of stories per quarter containing the gloomy term in the New York Times and the Washington Post. That index reached 855, a value consistent with what we've seen at the beginning of recent recessions (see Chart 2). 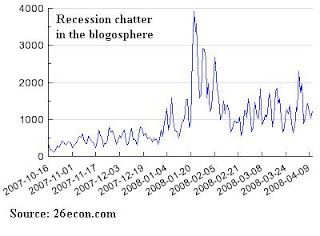 In March bloggers and googlers expressed about the same interest in writing and searching about recessions, respectively, as in February (see below). I don't think that buzz will escalate in April. Near the end of the month, however, we'll know the preliminary figure of GDP growth during the first quarter. That will generate lots of R-talk, especially if the number is negative or zero. It deals with an economic analysis of current issues.For every week, the result will be given.